Frederick William (Fred) Leist (1873-1945), artist, was born on 21 August 1873 at Surry Hills, Sydney. He was the eighth surviving and fifteenth child of Edward Frederick Leist, builder, and his wife Harriet Eliza, née Norris, both Londoners. Leist was educated at Crown Street Public School and, while training as a furniture designer in the workshops of David Jones Ltd, studied art at Sydney Technical College before becoming a student of the Art Society of New South Wales; under Julian Ashton's tuition he learned plein air techniques. On 29 January 1898 he married Ada Sarah Roberts with Methodist forms. As a black-and-white artist, Leist drew for the Bulletin in the 1890s and became staff artist on the Sydney Mail; he was also local representative for the London Graphic from 1900. According to William Moore he 'was the first to portray the Australian girl as a definite type'. Leist was an original council-member of the Society of Artists, Sydney, in 1895 and, after their merger, of the Royal Art Society of New South Wales. However in 1907 he was one of the twelve who re-established the Society of Artists. Next year Leist, with his wife and daughter, went to London. He joined the staff of the Graphic and illustrated for magazines and publishing companies, but he found that the Graphic 'worked the tail off me'—he wanted time to paint. From 1910 to 1925 he exhibited regularly at the Royal Academy of Arts. His first successful picture, 'The Mirror', a portrait of his daughter, was hung on the line at the Royal Academy in 1911 and next year at the Salon de la Société des Artistes Français. At the 1914 Royal Academy exhibition his painting of two Spanish guitar players, 'The Rivals', was acclaimed. The Review critic wrote: 'it is a composition in light and a pattern of colour, given power and meaning by restraint'. 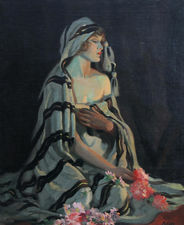 Noted for his studies of handsome women, Leist was elected to the Royal Society of British Artists and to the Chelsea Arts Club in 1913 and next year to the Royal Institute of Oil Painters; later he also exhibited with the Royal Society of Portrait Painters. During World War I, Leist worked for the War Office designing recruiting posters. Then, in September 1917, he was appointed an official war artist with the Australian Imperial Force and attached to 5th Division headquarters as an honorary lieutenant. From September to December and from June to August 1918, 'dodging shells and mustard gas', he produced about 150 small sketches, drawings and watercolours, and a portrait of Lieutenant-General Sir Talbot Hobbs. He later fulfilled commissions to paint four large battle scenes including 'Battle of Polygon Wood' and 'Capture of Mont St Quentin'. The striking colours of these battle scenes are in strong contrast to the delicacy and muted tones of his watercolours such as 'The Lacemaker'. In London, Leist consolidated his reputation: he was represented in the 1918 exhibition of Australian war artists at the Grafton Galleries and showed regularly at the Royal Academy and with sundry societies. In 1922 the National Art Gallery of New South Wales paid £400 for his 'Shadows' and 'Between the Lights'. He painted a miniature picture for the Queen's Dolls' House and his decorations 'did much to make the Chelsea Arts Club's ball one of the events of the year'. In May 1924 he designed the costumes and painted a vast back-cloth depicting the Rocky Mountains, fir trees and wigwams for Samuel Coleridge-Taylor's oratorio, Song of Hiawatha, at the Albert Hall. That year he was elected to the council of the Royal Institute of Oil Painters. He painted two huge murals for the Australian pavilion at the British Empire Exhibition at Wembley in 1924-25, and designed and supervised the construction of a large action model, with real water, of Sydney Harbour and its foreshores. An American millionaire D. P. Davis visited Wembley and offered Leist a lucrative contract. In 1925-26 he produced similar models and murals at St Augustine and Tampa, Florida. He travelled through Texas, New Mexico and Arizona and was deeply impressed by Taos Indians. Leist joined his wife in Sydney in December 1926 and lived at Mosman. He held one-man shows of his American paintings with a few Australian landscapes at the Macquarie Galleries, Sydney, and the Fine Art Society Gallery, Melbourne, in 1927, and at the Blaxland Gallery, Sydney, and the Sedon Gallery, Melbourne, in 1934, this time including such early paintings as 'The Mirror' and 'The Rivals'. In 1929-38 he taught painting at East Sydney Technical College. He also painted portraits—those of Sir Littleton Groom, Sir Earle Page and Patrick Lynch are in Parliament House, Canberra. In 1934 he published an article, 'Mural Decoration', in Art in Australia. He joined the Australian Water-Colour Institute and the XV Group of Independent Artists, and in 1937 was a foundation member of the Australian Academy of Art, but soon resigned. 'Tall and lean, with the deep facial lines that come of much laughter and much experience', Leist had loved travel and adventure and wrote humorously about his encounters with bootleggers. Survived by his wife and daughter, he died in St Vincent's Hospital of cerebral thrombosis on 18 February 1945 and was cremated with Presbyterian forms. One of the most versatile Australian artists, Fred Leist was essentially a decorative painter and 'a colourist of no mean order, interested above all in problems of reflected light'.